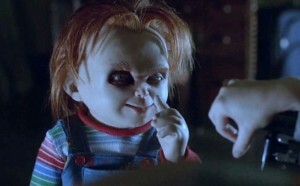 Dirty Horror Question Of The Day: Why Am I So Excited For ‘Curse Of Chucky’? In addition to that, reviews have started showing up online after Curse Of Chucky’s premiere at the Fantasia Film Festival over the weekend. And from what I’ve skimmed, those who have seen it are saying it’s good. Chucky’s back to true form and dropped the comedy routine apparently, and that’s good news for fans of the first few films in the Child’s Play franchise. I was never exactly blown away by Child’s Play and I never found Chucky to be too scary (personally found Bushwick Bill of the Geto Boys more frightening), but the movies were enjoyable and something a little different for the time. And as a horror fan, I’m definitely happy to get Chucky back to his horror roots even though his face looks like it went through a wonky CGI transformation. Nevertheless, it seems those involved with this resurgence of our favorite Good Guy may have dropped the ball by not putting the reboot in theaters instead of going the straight to DVD route. This is based off of early response from the screenings and reviews of course, but if writer and director Don Mancini got it right, it seems a bit of a shame that most of us won’t get a chance to see it up on the big screen. Where you can enjoy it though is on your big screen at home when it hits VOD on September 24th and on DVD/Blu-ray on October 8th. I wouldn’t be shocked at this point if Curse Of Chucky realizes the public demand and makes a short theatrical run. Stranger things have happened. Like Chucky having a son who had some transgendered confusion. Ugh. This entry was posted in News and tagged bushwich bill geto boys, child's play franchise, curse of chucky don mancini, curse of chucky red band trailer, dirty horror, fantasia film festival, good guy dolls, news by Dirty Horror. Bookmark the permalink.